Regular Pilates practice will improve your health and happiness! I first tried Pilates around 15 years ago as I wanted to improve core strength and posture plus reduce lower back pain. I was amazed at the positive difference Pilates made physically and mentally and so took it up professionally. I love teaching and watching people develop their confidence, technique and fitness through Pilates. We work hard but have lots of fun too! Most people have heard of Pilates. It’s massively increased in popularity over the years, but why? Pilates is now a part of mainstream fitness in health clubs and studios across the globe. Many people use the exercises to achieve their fitness goals and to enhance their exercise regime. Since the 1990‘s the scientific community (Osteopaths, Physiotherapists etc) have recognised the contributions that Pilates exercises make to injury rehabilitation, giving this form of exercise huge awareness and credibility. The original exercises have been modified so they are suitable for all fitness levels and abilities. 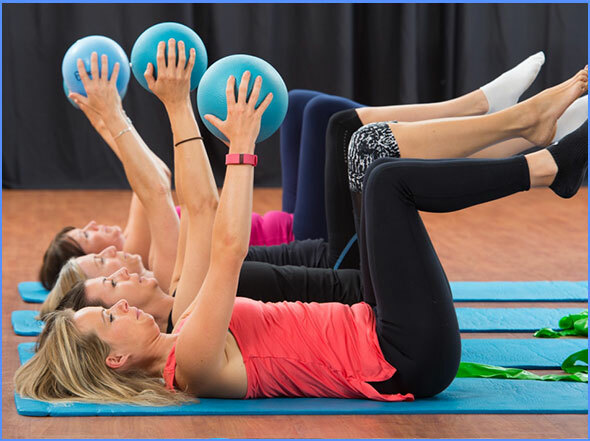 Pilates helps retrain the mind/muscle connection, whilst building up the strength and endurance of our deep core stabilising muscles. The sequence of exercises help mobilise the spine and body, whilst increasing our range of movement and reducing stiffness. The Pilates moves and stretches improve overall flexibility. A big part of Pilates is strengthening the core muscles. However we also work on building strength and tone across the whole body. Pilates uses sequences of moves to address the muscle imbalances affecting poor posture. Being bodily aware helps improve posture in everyday life. Pilates increases blood flow, reduces blood pressure/ stress levels and enables elevated mood and better sleep! Pilates doesn’t just have to be about back and postural problems – some people just love the varied routines and social aspect to classes. I offer private lessons in my studio or at your home. You may be a complete beginner, recovering from injury or have a fitness goal to work on. If so a private lesson would benefit you. I aim to provide a friendly, knowledgable, positive, open and personal environment for each of my clients. I work on students technique first and then build up levels to keep everyone progressing. I enjoy teaching using small equipment such as chi balls, dynabands and pilates loops and include these in my routines to add variety, assistance and resistance. I have been attending weekly classes with Essence Pilates for more than 4 years. As a result, I’m fitter, stronger and more flexible. All good news when you’ve a young family and a golf problem! I’ve no doubt that there are wellbeing benefits as well. Tamsin is a brilliant instructor who immediately puts you at ease. She really knows her stuff and her classes are great fun. Tamsin’s teaching make her classes accessible for a complete beginner and even within the class she helped me adjust positions individually to best suit my needs. I saw and felt an improvement after only a few weeks. I would highly recommend her classes! I have been attending Essence Pilates for nearly a year now and have found it to be excellent at increasing strength and flexibility whilst at the same time a great stress reliever!! Tamsin is incredibly knowledgeable and will offer different levels of difficulty to suit individual needs and is always very approachable and friendly. I would highly recommend Essence Pilates!! Having done Pilates for 8 months in 2013 (once per week), I wanted to find a Pilates class in Godalming as we have just moved to the area. I had my first class with Tamsin last Friday, and can highly recommend her as a teacher. Warm, personable and encouraging, Tamsin is able to effectively teach Pilates to a class of all shapes and sizes; she enables everyone to work at their own rate, often setting 2-3 levels within an exercise to make it accessible for everyone in the group. I started going to Tamsin’s Pilates class in September 2013 and I love it. Her style is relaxed, friendly and very warm. What makes her classes so popular, other than the fact that they are fun and she is so lovely, is that she always gives us different levels to work on, so we always have the option of challenging ourselves whilst being able to choose what level we’re comfortable with. Tamsin therefore makes everyone feel like they’re progressing, no matter their level. I especially like her use of apparatus like rollers, balls and therabands so that I have the option to work on strength and balance. She also regularly introduces new moves so that classes never feel tired. We all have a laugh too, which means new-comers feel welcomed and don’t feel intimidated. My core strength has improved immensely and I wouldn’t be without Pilates now.